This is nothing earth shaking. I’m just trying to decide how best to paint two new brick structures that I just finished. The brick material itself is made by Rusty Stumps and is a laser engraved board that is thin and stiff. It has been laminated to heavier stock underneath because the brick sheet is about .030 in thickness. In the past I have used two different methods in painting vacuum formed plastic brick. I call them positive and negative. What I mean by ‘negative’ is that I prime, then paint the red brick color. After that dries, I wash the mortar color over the brick and then clean off the brick surface by wiping off the excess. This method leaves the mortar color in the groves. The ‘positive’ method is paining the mortar color first which can also be the primer. After the mortar color has dried, then the brick color is carefully dry brushed across the sheet, hopefully touching only the raised portion which is the brick. There is another variation of this and that is to use a large flat rubber eraser. Smooth out a thin layer of color on a plastic or glass sheet and press the eraser surface into the color, then transfer the color to the brick similar to pad printing. This is a little tricky getting into corners but it works well on the main surfaces. I plan to test both methods on some sample material, but am wondering if there is yet another method out there that I don’t know about.?? Today we made good progress on several fronts. I got the river base sealed which is prior to the plaster cloth application. Work on the photographic backdrop was completed and the printing ordered. On the structure front, the freight house was assembled. Then I planed the ties down to about half height or a bit less. I have a nice Makita power planer which did a great job. For me I think it is much better than sanding. Hand sanding is just too much work for that size area and I am afraid I could not control a belt sander well enough to avoid damage. The trick of planning is to hold the planer so that it is skewed and is cutting across at least 2-3 ties at the same time. In that way the tendency to pick up the ties is diminished. In the whole yard I only picked up 4 ties. Now the yard is ready for distressing and coloring. In the actual yard at Calais the ties varied from bleached to creosote stained almost black. A few ties were replaced but most were old, rough, and some split. For an area like Calais it seems like each individual tie will need to be addressed as a model., but in my mind this is what P48 is really all about. Yes, there are the obvious wheel and track standards to be met, but old track requires a lot more attention. This particular challenge is what drew me to P48 and its goal of accurate prototype modeling..
Calais had at one time a series of unique features which make it what it is. I will try to capture these features and incorporate them into the scene in order to be recognizable. This is Calais Yard looking to the north. At the far end is a bridge which carries the road over the track. 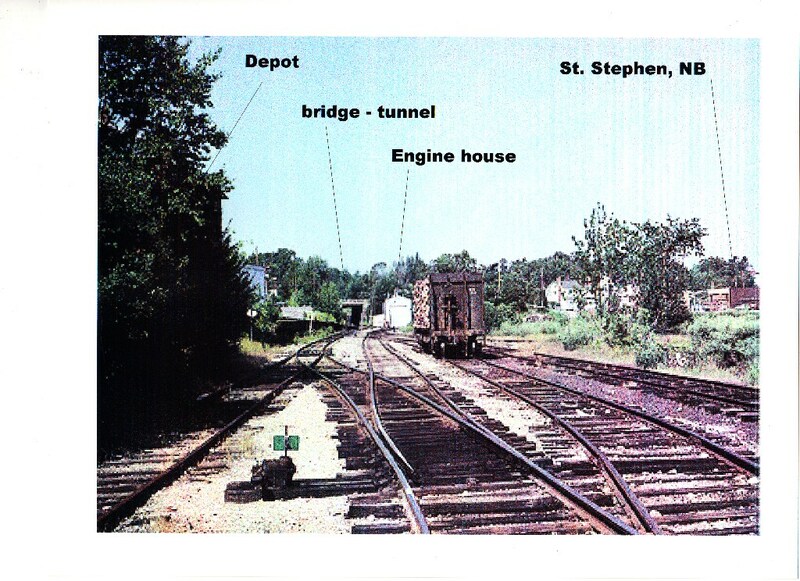 The road crosses first the yard and then over a bridge leading to customs in St. Stephen. One can barely make out the depot through the trees on the left. The passenger shed was taken down many years before. During my era modeled Calais was freight only. The engine house is a sheet metal affair, with barely enough room for the S2. A pulpwood spur curves to the right out of sight behind the pulpwood flat. The lower scene is Calais Yard looking south. It is fairly flat except for the freight house tracks which do rise up. The St. Croix River runs along the edge of the yard and serves as the dividing line between the two countries. It is also a tidal river which opens into Passamaquoddy Bay. 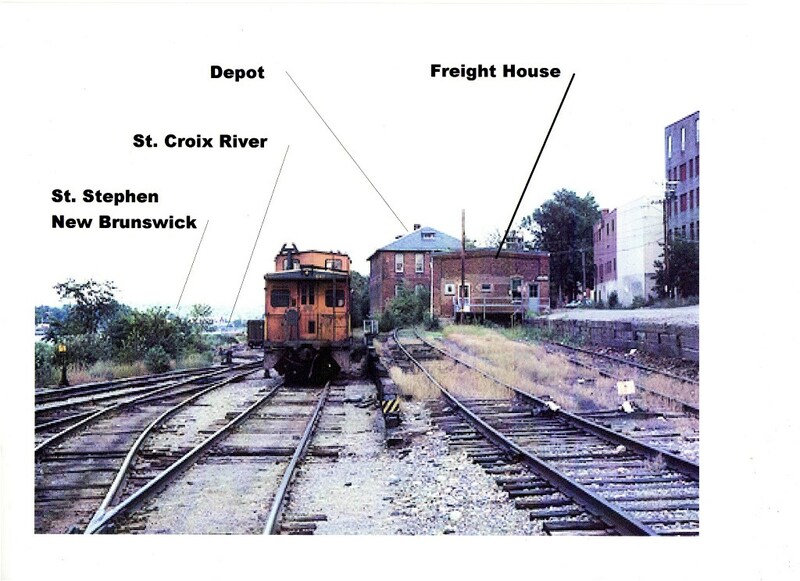 At one time there were many wharves along the river that were served by the railroad. Today there are only a couple of eroded mounds left that give little evidence of a much busier time. By my era, the wharves were gone. As you can see there is not too much left to characterize the yard, but I will try to capture its essence. In the model Calais will serve as a storage location for cars going to and coming from Eastport via Ayers Junction. It will also serve as a photo diorama for motive power associated with the Calais Branch traffic from Bangor. Sometimes we rub shoulders with history closer than we realize. 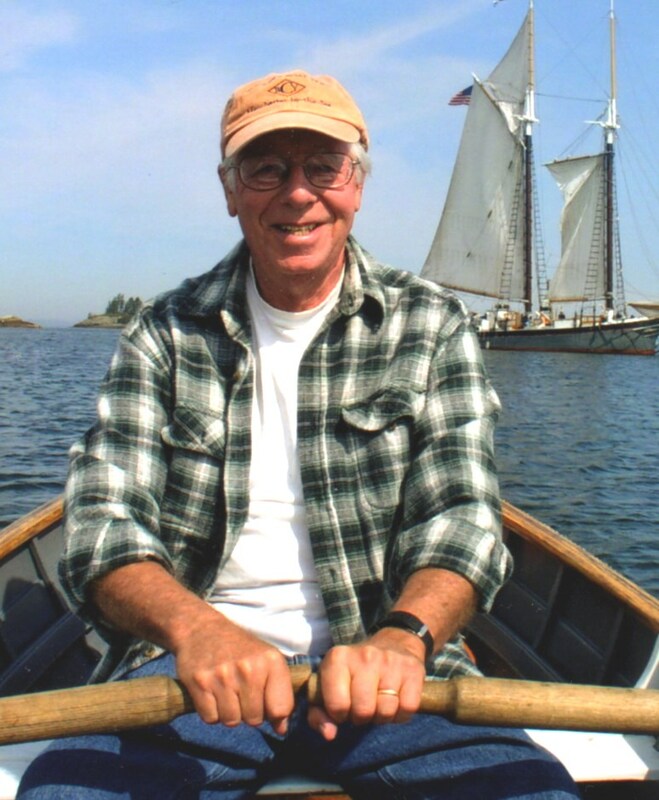 I don’t know if you have looked at my avatar photo closely, but there is a schooner in the background. That is the Lewis R French, the oldest schooner in the windjammer trade out of Camden, Maine. My wife and I have sailed on her numerous times. I first made my choice based on a wood ship with no engine. The boat was built in 1871 and is a National Historical Landmark. In the photo I am sitting in one of the skiffs that is usually carried on board, but when anchored, I get a chance to row. Then recently while doing my Eastport Branch research, I discovered a photo of the French without masts and with an engine working as a freight boat out of Eastport. I’ll talk more about the French later. I’m sure glad it was restored to sailing capacity.